Black impoverishment in the US is holding steady under US President Barack Obama. 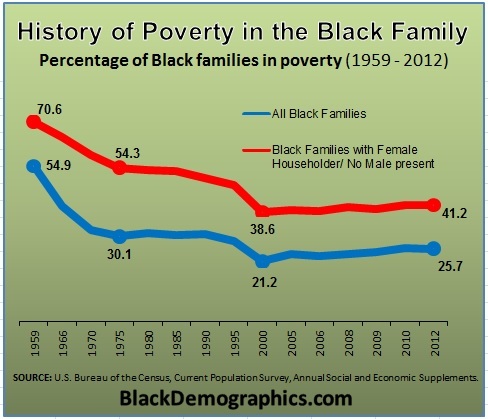 Black families cannot seem to escape poverty under Obama, while families of other races improve their economic conditions. 95% of American blacks who voted, voted for Barack Obama in 2012 and 2016. They did so for a variety of reasons — including ethnic pride. But the hope that Obama might do something to help the economic condition of underclass blacks, remains unfulfilled. … black families in the bottom half of the income distribution consistently did the worst of all racial groups, with greater disparities the farther down the distribution you went. Despite the post-recession recovery, black children at the 10th percentile saw no increase in household earnings. … black families did not do well. At the 10th percentile, black families consistently had zero earnings from 2011 to 2013. 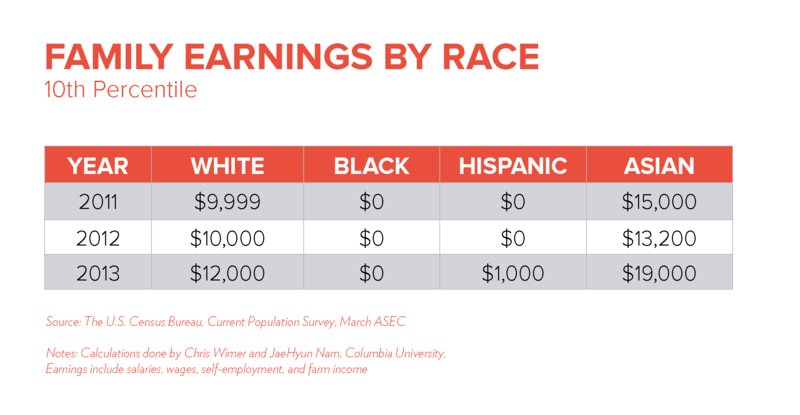 In contrast, white, Asian, and Hispanic families experienced a net increase in earnings (though a minimal one for Hispanics). … At the 25th percentile, black families’ earnings increased over the three years, but they were still consistently half the level of the next highest group, Hispanics, and less than a quarter of whites and Asians. In 2013, the 25th percentile of family earnings of black children was $9,000—not enough, if you were not including social programs, to keep even a single person above the poverty line, much less a household with children. The article at the link above recommends the standard “cure” for black powerty: more government handouts. But such remedies have always failed in the past — in fact they have made the situation worse, if the state of many of the US’ inner cities is any guide (eg Detroit). Most social analysts and policymakers have not taken the trouble to understand why blacks are the impoverished race, wherever in the world they go. The poorest nations in the world are nations with majority black populations. The poorest sub-populations in cities and nations with diverse ethnic populations, tend to be sub-populations of African descent. Why do blacks lag in terms in income and achievement. 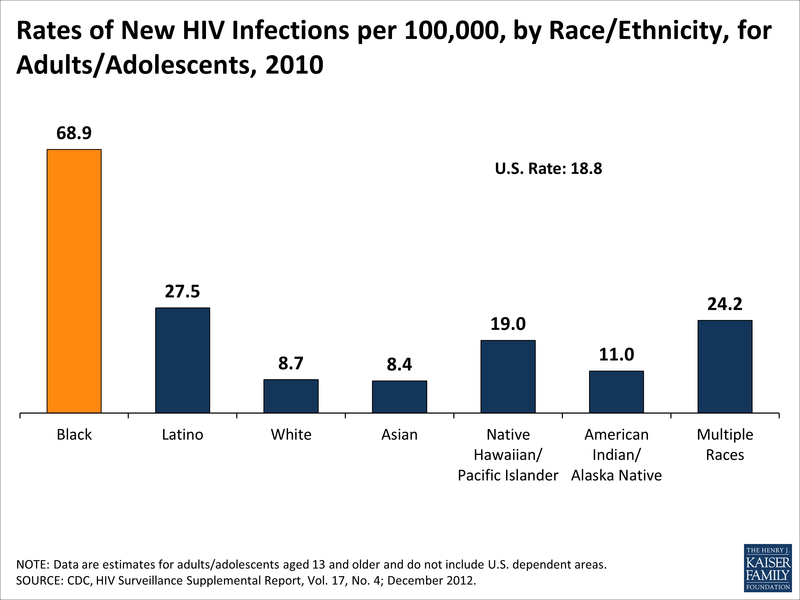 Why do blacks lead in terms of violent crime, drug dependency, and government dependency? 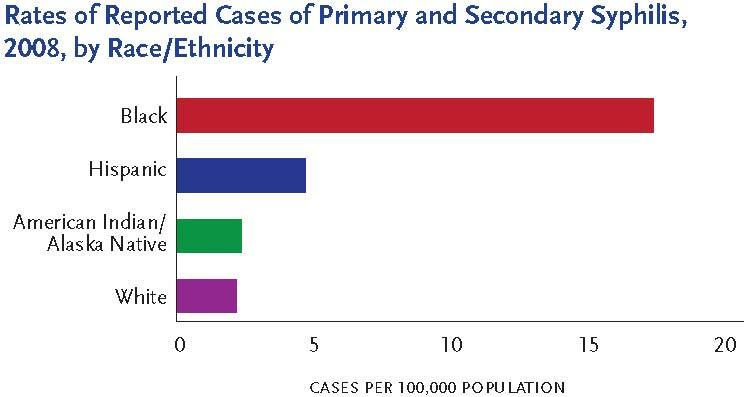 Looking at international, national, and regional crime data, it would appear that the causes for black poverty, crime, lack of achievement, and addiction behaviours are at least partially based on their genomes. Science will have to study this phenomenon more intensively to get at its root. 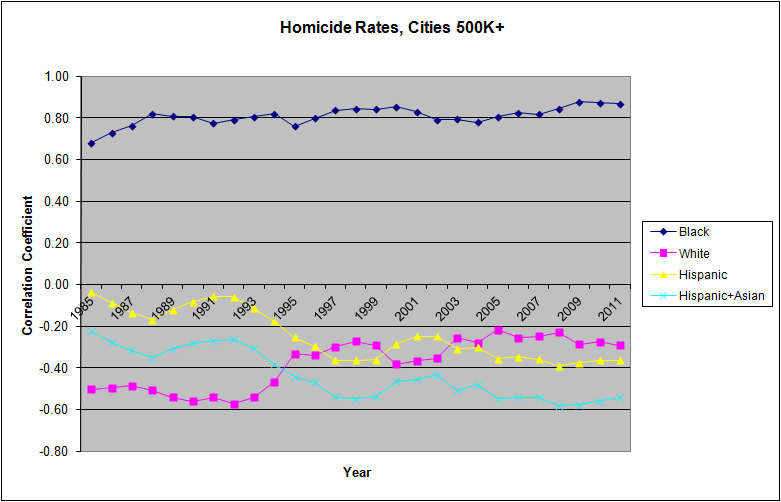 The correlation of race and violent crime in large US cities is clear from the above graph. 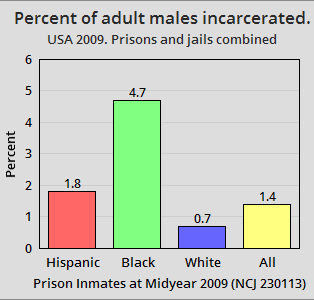 Black populations are positively correlated with violent crime rates to such a degree, that one would also expect high arrest and incarceration of blacks for violent crimes. And that is what we see. Why are sociologists so reluctant to point out the cluster of correlations — 70% born out of wedlock, high rates of school dropouts, high rates of crime, high rates of inter-generational poverty and government dependency, a blind culture of violent resentment and grievance, high rates of self-destructive behaviours and poor impulse control, etc. etc.? Most sociologists are leftists or liberals, and are extremely reluctant to admit to biologically based group differences in IQ, executive function, impulse control, honesty, violent behaviours, etc. — even when the evidence is quite clear. Why are they so blind? [T]hose most likely to inaccurately underestimate real differences were liberals in denial about group differences. . . [I]ntelligence did not matter for this group. Brainy liberals were just as likely as dumb liberals to inaccurately minimize real differences. It’s the opposite for non-liberals. The smarter they are, the more likely they are to have an accurate understanding of group differences. This makes sense, since smart people are usually more knowledgeable about the world. Prof. Jussim wonders whether smart liberals have actually managed to block reality or whether they know the truth but refuse to admit it. This is a fascinating juxtaposition: Brighter leftists are no more likely to understand group differences than stupider leftists. On the other hand, the brighter the centrist/libertarian/conservative, the more likely he is to sift through the evidence and arrive at a rational conclusion on group differences. Black communities across North America are filled with gang members, activists, militants, community organisers, and others violently predisposed, who are just waiting for the chance to instigate or commit violence and mayhem. The “censored race war” has only grown worse since Thomas Sowell wrote about it in 2012. They are spurred on by community media, rap lyrics, community race-baiting leaders, politicians, community organisers, and other untrustworthy denizens. If the wider skankstream and propaganda medias were willing to do something extraordinary and present the world as it is to their consumers, the problem would be “outed,” and solutions could be sought by a wider range of thinkers and doers. Black communities — when faced with the truth of their own culpability in race-based violent crimes — might feel motivated to look for better ways to create future generations of blacks. But the mainstream narrative is not wide enough to include science-based information that is not politically correct. And so any city, province, or nation that is stuck with large proportions of african-derived residents will have to deal with the accompanying problems on an ad hoc basis — after the problems have grown acute and endemic. When members of one population group present themselves as high outliers for a broad cluster of dysfunctional outcomes — despite $trillions spent on reversing the long-term problems — thinking persons need to sit up and take notice. Instead, politicians, academicians, journalists, intellectuals, and members of many other cultural institutions refuse to even acknowledge that there is a deep-seated problem that is based upon innate characteristics of this outlier group. This will make things difficult for those of us who must live with the fallout of the bad decisions made by those who tell us what to think, and who so willingly spend our tax dollars in ways that are destructive to our own hopes and dreams. Hope for the best. Prepare for the worst. It is never too late for a Dangerous Childhood. This entry was posted in Africa, Blacks and crime, Demographics, Genetics and Gene Expression, Groupthink, IQ and tagged Barack Obama, black families. Bookmark the permalink. Racial differences extend to unsuspected areas. E. J. M. Witzel’s “The Origins of the World’s Mythhologies,” (Oxford, 2012) argues that there is a common Eurasion mythology that shows up in such places as the Hebrew Bible, the Norse Eddas, the Rigveda and Chinese, Korean and Japanese stories. This myth is a theory of the origin, evolution and end of the world and of people and kings. SubSaharan Africa, New Guinea and Australian Aborigenes have a much simpler and different mythology, parts of which carried over into the Eurasian myths. It’s pretty hard not to think that for the branch that went north Out-of-Africa was an incipient speciation event that did not develop fully separate species. With the historic black migrations now underway, some of the incipient speciation might be undone.